I had no more returned from a stay at the Reynolds Plantation east of Atlanta than I found Golfweek magazine had placed four of the courses on their list of “Best Courses You Can Play.” From firsthand knowledge the magazine is certainly correct in their evaluation. 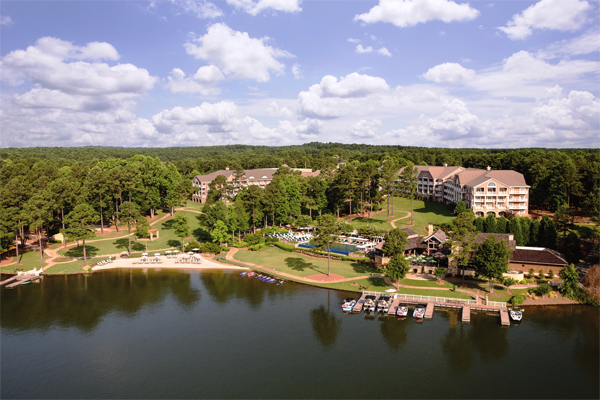 On the shore of Lake Oconee the Ritz-Carlton offers first class service and accommodations. Of the six courses at Reynolds Plantation the Jim Engh-designed Creek Club is private but visitors shouldn’t feel short changed because the remaining five provide a great way to spend a week. You can stay at the Ritz-Carlton Lodge and Spa or in one of several cottages on the property but in either case be prepared for a really fun golf experience. Start your visit with a lesson at the Reynold Golf Academy run by director Charlie King who is ranked as one of the best instructors in the country. Follow up with a club fitting session at The Kingdom, TaylorMade Golf’s state-of-the-art fitting center which until recently was reserved for use by TaylorMade’s tour staff. The real fun begins on the course and you might start with the Bob Cupp designed Plantation and Landing 18s. 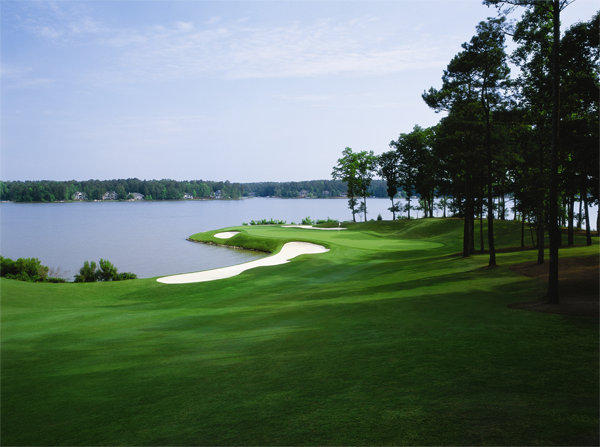 The Landing which opened 1986 was the first course on Lake Oconee and renovated by Cupp in 2014. It plays to a par-72 with the rearmost tees 7,048-yards. His Plantation course had an updating of fairways, greens and bunkering in 2005 and the original layout was designed in conjunction with two U.S. Open champions, Hubert Green and Fuzzy Zoeller. Number 11 on Great Waters course is a short but challenging par-4. We especially liked Great Waters which for three years, from 1995 to 1997, was site of the Andersen Consulting World Championship of Golf. This Jack Nicklaus design is a dramatic layout with the front playing through forests lining the hills overlooking Lake Oconee. As you make the turn, the lake which you have been seeing from afar, is all at once the major feature you must play around…and over. The other Reynolds Plantation course that was really appealing were the three nines of the National by Tom Fazio with the Ridge and Bluff nines opening in 1997 followed by the Cove in 2000. Fazio oversaw a major remodeling last year tweaking what was already a fine experience into one you will really remember. If you play at the right time of the year you will be treated to the flowering of the dogwoods sprinkled along the hillsides as the fairways above the lake provide views worth stopping to make a record of with your camera. You will also like the Oconee layout, a Rees Jones design that he refurbished in 2013. Jones, who is known as the “Open Doctor” for the work he has done in preparing sites for the U.S. Open, routed the fairways along the shoreline and made it a track where prudently taken risks can be rewarded with relatively easy scoring opportunities. Reynolds Plantation has a number of other ways to spend time when not on the course from bass fishing, boating, water skiing to the Peter Burwash International Tennis Center and the Lake Club Wellness Center. So, whether it is golf trip with “the guys” or a family vacation Reynolds Plantation is a place to build warm memories. Been a while since golf in Orlando. Hope all is well. JW and I are looking for a writer to do a piece about golf and fishing at Reynolds Plantation. Bev Berado told me you’d been there recently, so I was wondering if you’re a fisherman and if you’d be interested in doing the piece. We’d need in the neighborhood of 750 words by Dec. 1. JW pays $250. Let me know if you’re interested. Hope your game is well.